Well, here we are again, another month has quickly passed by and our December WiN Bazaar is this Thursday, Dec.1st at Adelaide Place! The Bazaar will run from 11am to 2pm and, if you have a table, you can arrive any time after 10am to set up. Lunch will still be served in buffet format at noon. In order to make this event successful please be sure to invite friends, family, colleagues... 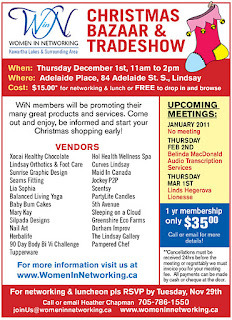 They can join us for a tasty Adelaide Place lunch and networking for $15 (please RSVP) or they can stop by any time between 11am and 2pm (no cost) to shop the bazaar and get to know our great ladies and their products and services.